← ONE MONTH, ONE MONTH, ONE MONTH!!! As y’all know, a lot of our wedding decor is DIY; I’ve spent a lot of time being “crafty” but I’ve also found some amazing steals on Etsy! I could literally sit on Etsy all.day.long! From jewelry to bridesmaid gifts to adorable wedding decor, it has it ALL! I’m not going to give away all of the fabulous vendors I worked with just yet because I can’t risk my sweet ‘maids or amazing mom figuring out what their gifts are 🙂 PLUS I have to leave some of the details a surprise! (I plan to do a post after the wedding that lists every vendor, shop, etc we worked with to make our day perfect!). However, to hold you over until then, here’s a picture of the most PERFECT earrings!!! Remember when I asked for opinions on what to wear? Well after months of searching and continuing to come back to these beauties, I decided to take the leap and purchase them online. I was hesitant because I couldn’t actually see them in person, try them on, etc. But I was happily surprised when they turned out to be more than perfect for my dress. Not too big, not too small, super sparkly… so me 🙂 The Etsy shop was so sweet and even asked for pictures after the Big Day! I would definitely recommend them to any fellow brides out there! 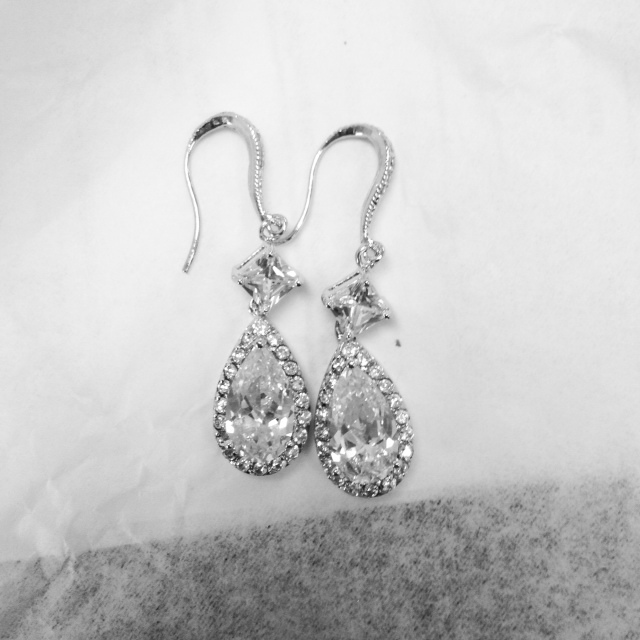 Pretty earrings for a pretty bride.